A claim for the area marked 23 on this map. Note: The SH region style has been expanded a bit since this thread, see my Beorinhal claim for some examples. This includes expanding the land texture set from using literally one texture. The ridge on the eastern side of this claim should be changed into a plateau, possibly slightly declining going east, but not this type of vertical cliff that it currently is. To the north lies the Midkarth farmlands and to the East are the Ridgelands of Lainalten, Whiterun hold. The region transition should be made using brown grass and rocky dirt, with the dry grass white rocky dirt texture used with intensified frequently going south-west. Points of interests: We will need to discuss this further. There's an Orcish nomad camp in neighbouring claim 15, pushed out of the southern SH by the Reachmen. The entire region is generally a badlands region, with badly maintained roads and lawlessness running wild. You could put one or two bandit caves, a small primitive barrow and perhaps an exterior bandit camp. There's no roads going through here except the one running along the northern edge, which should use the northern Midkarth region setup. Would this be a good place for a Horme camp? We'd probably have to figure out to distinguish them from regular bandits, though. Other than that, I think this stretch of wilderness can get by on the kind of locations you mentioned, roerich. Maybe have one bandit cave, one natural cave with animals in it, a small barrow, and then the Horme camp (if we go with that idea here). I've looked through the claims forum, but I can't find this. You'll have to point it out. Looks like it has already been done. Instead of a river it slopes into grass land texture. Indeed. The overview map of the reach we keep using shows an utterly outdated state of everything. There is also the location map workshop as the most up-to-date source of landmass-info we can offer on this forum. At least it should help with the roads. Oh, perfect. 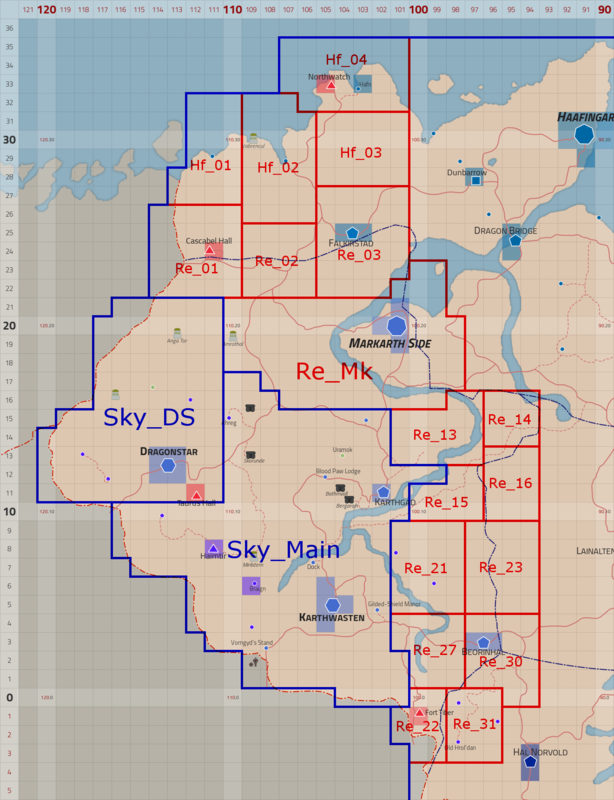 Having an updated ingame map to plan from would be great. I've lost the overview of all the new changes to the Rest Exteriors file. Though that claim needs to be cut from the rest exteriors, and I'll need to mark up the borders of the claim and merge it with Spineinside's showcase. Work work work. And a Hörme camp sounds good. For starter's we'd just need a tatterered banner or something else to show that these aren't just regular bandits. This really should be revoked by any standards I might have held dear at some point. Revoked. No updates and user was last active in May 2017. Early version, merged my cells that thal borrowed, as well as the northern cells of RE30. Began diversifying the ground textures below the cliff, Matched cells with claim 30, and did some work on the mountain.